Thanks To Her, You Can Now Breastfeed Your Baby In Public...But Away From Gaze! Just recently, in November 2018, a woman trying to breastfeed her 7-month-old baby in a prominent city mall at Kolkata, was asked by its employees to do it in a washroom...triggering outrage on the social media. Another woman down South, was trolled for being on the cover-page of a magazine, since she was trying to promote breastfeeding the child wherever and whenever needed. In short, women are judged for doing a much-needed chore that is required for the baby's health. WHO recommends that mothers exclusively breastfeed their infants up to 6 months of age at least. In India due to lack of facilities, mothers often resort to alternative methods. In the 1st few months, moms are asked to feed the baby once every 2-3 hours. With lack of hygienic breastfeeding rooms in the country, most moms refrain from going out or end up feeding the baby formula feed instead of breast-milk. At present, all the baby feeding and care rooms are usually inside or next to the toilet. It is the most unhygienic spot to feed an infant! While most of us feel helpless in such a situation, one woman decided to bring the desired change for the betterment of such breastfeeding mothers. Meet 49-year-old Ganga Raj - the founder of "I Love 9 Months." Ganga hails from Thiruvananthapuram, Kerala. Ganga Raj is presently super-busy installing breast-feeding pods in her region. She is a very active member of the SHEROES BabygoGo and SHE STARTS UP Communities. Breastfeeding pods - Ganga Raj came with the concept of Domatio - a small 4X4ft sized cabin that can be installed at any corner of a bus stop, railway station, airport, restaurant or a large retail store. "Mahima, the idea is that new mothers can comfortably feed the baby and continue on with her work/day out. You can have multiple Domatio’s in diﬀerent places so that mothers don’t have to go to one speciﬁc place. Having a small baby should never restrict a mother from going out with her family and friends. Its critical to her own mental health as well. The feeling of restriction and frustration can lead to postpartum blues and depression in many women," details Ganga in one single breath. A breath that has hidden anger, a breath that is determined towards being a change she wants to see. Ganga has been into 'Fitness and Wellness Consulting for the last 20 years. She also specializes in Prenatal and Postnatal wellness. She begins detailing why she stepped into this arena and why I can sense some personal appeal behind her idea, "Mahima, I travel a lot on work. And whenever I travel, I see women struggling to breastfeed their baby. It is a problem faced by every nursing mother when they step out of their home be it airports, railway station, bus station or any public place. This is frustrating for the mother and brings in a lot of emotional stress, because she hates those stares, those public glares. Also, the mothers tend to start early weaning to avoid this problem. And this problem is faced every woman irrespective of the social strata. Thus, we decided to bring in Breastfeeding Pods for public places. So what facilities does a Breastfeeding Pod have? Name the Domatio, a typical breastfeeding pod has a 4X4ft. Modular Room, a Comfortable bench seat, table to change the baby's diaper, a fan, a light, charging point for cell phones, a sanitizer holder as well as an 'IN-USE' lock for privacy. The journey has just begun says, Ganga. The Public place model was launched in Thrissur in a Fine Dining Restaurant earlier this year. And now they have got an order from Kochi Metro to put up 16 Breastfeeding Pods in all the 16 Stations. 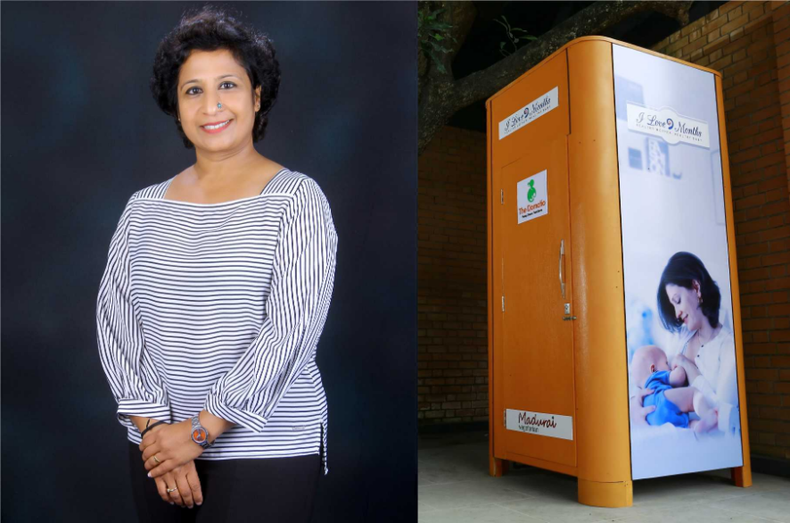 Ganga also has bigger and better plans, even for the working women, " We plan to set up Lactation Pods in corporate workspaces where a mother can pump breast milk, store it and carry with her for the little one. The Lactation Pod is in Technopark Trivandrum for the employees working in Technopark Campus, We are in talks with 3 large corporate houses to put it up in their premises. We hope to make this a reality for 15 million women every year." The cost of setting up one Public Place model is 1.5 lakh + GST while that of setting up a Lactation Pod is 2.5 lakh + GST. But you will be surprised and happy to know that the usage is FREE OF COST!! Ganga smiles," New mothers are as it is so mentally taxed, why worry them more? Our revenue generation is through Sale, Rental and Advertisements on the Pod." Ganga also recalls how her being a part of SHEROES Summit in Trivandrum was a boost to her idea and ideology, "I was very inspired by Sairee's talk. The decision was immediate and I remember downloading the app during the event. Today I have a great connection with so many women doing awesome stuff. Its great to know and share experiences, learn and the feeling of being a part of a larger section of women trying to do meaningful things is very satisfying." And for making her mission become sustainable, Ganga and her team - her husband and daughter - have been working round the clock with the support of her sister. "It is indeed difficult but I try to strike a balance. Since the whole family is involved in the start up we are always in touch with each other. On the other side, I haven't attended social gatherings for a long time. But, I am lucky to have friends who understand what I do and are very supportive. Try to talk to them whenever I can," Ganga details with not a single emotion of regret. "No regrets Mahima...rather it would be the happiest day in my life, when women can breastfeed in public space with the onlookers staring and passing comments. We as a society lack sensitivity to such things, and hence it’s a struggle for every nursing mother. We as a society need to sensitize people and at the same time empower women to make bold choices," asserts a very determined Ganga Raj who still manages to find time for daily Weight Training, Yoga and Barre and of course running...which she stays keeps her going! She adds that if we all stop poking our nose in others' affairs, we all have enough time to chase our passion in lives. On the lighter side, she adds that she loves NOSE-PINS though. And we both burst into laughter. "I will be in your city with breastfeeding pods someday soon. Till then, always remember MEN CANNOT BREASTFEED. So feel the power you have to nurture a life. It's your right to breastfeed your baby and it’s the right of every child to have their mother’s milk. Don’t Feel Shy. Speak up for your entitlement to have a safe and hygienic place to feed your baby. SPEAK UP." So that was Ganga Raju in an exclusive chat with me in our #MeetTheSheroes Series. You can follow Ganga on SHEROES. Don't forget to share this story of change in your circle, because this is not just a story but a mission to make lives better. And also do leave some words of love, for encouragement for Ganga in the comments column...she is the lone crusader right now, and needs our love the most! Great job mam. It's really a wonderful idea to make women comfortable for breastfeeding in public places. Really its a very good job useful to all mothers . All the mothers r thankful to u mam. That's great mam.i don't agree how this important part of a life can bother anyone?These stupid people who are pointing the women forgets that they were also nurtured when they came on this planet.And this not something which can be avoided.I don't understand what's the problem with these males??? ?The one who undergoes through motherhood only understand s this.How can a person who nvr gave birth and pain would understand this??? ?Shameless creatures just want a way to remark a women. Great job @ganga raj.......you actually done a heroic thing. Brilliant solution for the problem faced by every woman , a big thanks @Ganga Raj for this commendable job. I have suffered a lot when my kids were infants. Hope the present and future mothers live life to the fullest utilizing this facility. Wow.. Awesome.. Glad to know you.. Keep up with work.. 😊😊🤗..
Great initiative mam .Salute you for taking courage and bringing change. पुत्रवधू और उनके अधिकार !